Best appreciated if you know the entire cast of evil characters and a little Spanish, but I think most can enjoy this video whether you read Spanish or not. I have so much information coming in but feel very frustrated with what is coming out in the form of blog articles for you readers. Information constipation! I remember when we got home internet service after four years without. I searched some of the major US online news sources for stories about Honduras and all I could find were stories of the prison fires and Hurricane Mitch from 1998. That has certainly changed. 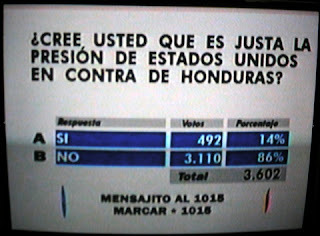 Now everyone knows everything (they think) about Honduras and report everything (that they think they know) as fact. Eventually, if it is repeated enough times, even the most outrageous claims become accepted as fact, even by WORLD GOVERNMENTS (! ), a phenomenon that the disinformers not only count on but work at very hard. Last Wednesday I was thinking that if only the world would stand still for a couple of days, I could catch up. Instead, the opposite happened. The world continued but my internet connection went out for three days. Thankfully, we get the paper version of La Prensa so I wasn't completely out of touch. The connection then came back for a day, not even long enough to get through 400 emails and dozens of news articles, and then it went out again for several hours, putting me even more hopelessly behind. Today it was in and out all morning, and mostly out all afternoon. Aaargh! I want to thank all of you who have sent information, links, documents, and kind words. I read everything and apologize that I haven't always had the time to thank everyone individually. I also apologize to those of you who wrote with questions that I just haven't been able to reply to. Someday the world will go back to ignoring Honduras except for hurricanes and earthquakes and I will get back to writing about more mundane things about life in Honduras. In the meantime, I have to do what I believe is right, and that is do what I can to try to combat the serious disinformation campaign against Honduras. Hat tip to Polliwog's Poliblog for the quote. As long as you cling to the belief that what happened in Honduras is a political power struggle between Mel Zelaya and Roberto Micheletti and/or the 'elite', you will never understand what is happening here. Mel Zelaya is for Mel Zelaya and he is doing everything he can to harm Honduras. Robert Micheletti loves Honduras and is doing everything he can to save it. It is about Honduras, not about these two men. It is that simple. “I am deeply disappointed that the U.S. has decided to once again come to the aid of Manuel Zelaya and go to such great lengths to defend his interests by penalizing the Honduran people. WASHINGTON – Congressman Connie Mack (FL-14), the Ranking Republican of the House Subcommittee on the Western Hemisphere, today urged the Organization of American States (OAS) to respect the Honduran Constitution and the rule of law. Mack’s call comes after an OAS team traveled to Honduras this week to push for the return of former President Manuel Zelaya. 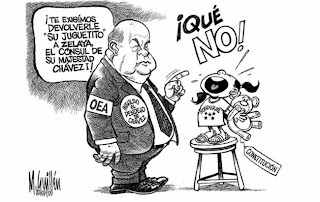 “It is clear that the OAS and Secretary General Jose Insulza are taking orders from Hugo Chavez. 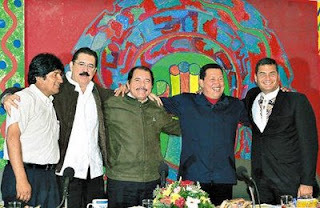 “Chavez will not rest until his friend and fellow thugocrat, Manuel Zelaya, is forced back into power. The Venezuelan leader continues to use the OAS as a tool to overrule the popular will of the Honduran people. “In what seems to be an attempt to overrule a sovereign nation’s Supreme Court, the OAS team in Honduras is attempting to circumvent the judicial decisions of independent bodies that have already said that Mr. Zelaya cannot return to Honduras as president. The OAS continues to undermine the Honduran Constitution, Honduran judges and the rule of law for the sake of political expediency. “After silencing Venezuelan judges, Chavez now is trying to silence Honduran judges by using the OAS as his tool. “I also find it shocking that the Obama Administration has facilitated this mission by providing support in the form of a military plane to the OAS. “Instead of providing support for a group whose mission is to undercut constitutional authority in Honduras, the Obama Administration should be prepared to assist the people of Honduras in their upcoming presidential elections. The following open letter was printed in the Honduran newspapers yesterday, in Spanish, of course. It is from Carlos López Contreras, Foreign Minister of Honduras, addressed to the Citizens of World. Happily, a translation to English was also performed. You can read the original letter in Spanish in the newspapers [I haven't been able to find it online yet], or the English translation here. I'm including the letter in full here because I want everyone to read it and I know that some won't click links or don't have the ability to open PDF files. As citizens of an increasingly smaller and interconnected global community, we are all responsible for respecting one other and for creating a better world together. Our diverse cultures, religions, and forms of government must continually search for ways to understand one another and work together. In Honduras, we have always worked diligently to uphold this responsibility as inhabitants of a global village. We have always remained steadfast in our commitment, and this past month is no exception. In fact, it is an example of what we must all vow to do from time to time: hold true to the principals of democracy and the rule of law while protecting the human and civil rights of our fellow citizens in the face of criticism and misunderstanding by certain sectors of the international community. Let me be clear about what we as Hondurans believe. We believe in the rights of every person to freely express themselves and their beliefs so long as it is done in accordance with the rule of law. We encourage full and equal participation in political discourse and believe that a free and unfettered press is a valuable part of that discourse. We believe that the Honduran government must act in accordance with the Constitution that establishes and limits its power to govern. As the Minister of Foreign Affairs, I am charged with representing the Honduran government and its people before the world. Now more than ever, my job is to bring an understanding to our shared global community of our dedication to uphold these beliefs, and ask each of you to consider our views as we consider yours. Yes, Manuel Zelaya was democratically elected as the Honduran President. We cherish democracy. Yes. as President, he did abuse his power and violate the Constitution. We respect our Constitution. Yes. his powers as President were automatically forfeited after our Attorney General investigated the violation and our Supreme Court ruled that the violation had occurred. We respect the rule of law. Yes, the military was ordered to arrest him as part of their Constitutional duty. We know this appearance might seem troubling to some, but it is clearly written in our Constitution -and has always been a part of our Constitution. Yes, it was a mistake to remove Manuel Zelaya, a Honduran national, from the country. We admit the error and are aware that there are consequences. Those consequences are that the Constitution and rule of law must be upheld. And so, the Attorney General opened an investigation into the expatriation of Manuel Zelaya on July 4th, and we await the findings of this investigation. • The restitution of the Presidential powers of Manuel Zelaya. This is not an option the Honduran Constitution grants to the government. In fact, it is clear that the exact opposite must take place. No powers under any circumstances. • The granting of amnesty to Manuel Zelaya by the executive branch. This is a proscribed duty of the Congress. and the Congress alone. This is their power. and theirs alone. • The unilateral decision to negotiate breaking articles of the Constitution in order to satisfy some members of the international community. Popular opinion by powerful nations does not rule our nation, and should not rule any country. Please consider what is being asked of our country: Break the Constitution. Ignore the rule of law. We simply can not do this because of a mistake in expatriating a Honduran national who had been Constitutionally stripped of the powers that democracy provided to him only to have him abuse them. We would never ask another nation to ignore its Constitution and trample on the rule of law much less purposely violate its Constitution to please our opinion. Each day, our citizens wake up and hope that through our insistence and dedication that we can bring understanding to others. We are thankful to friends who have courageously spoken up on our behalf. We are grateful for their support, and are humbled that they have chosen to work selflessly alongside us to bring other nations to understanding our commitment to democracy, the Constitution and the rule of law. We are a little country among the community of nations but our nation's larger mission is to protect human rights, democracy, the Constitution and the rule of law. We are confident that these are values worth standing firmly in order to uphold. We invite the world to examine our true intentions and decide for themselves. As we prepare to hold free and fair elections this coming November, our faith in these principles could not be more clear. "The OAS is pressuring the interim government to accept the San Jose accord, a plan proposed by Costa Rican President Oscar Arias that would return Zelaya to power until elections are held by the end of November and would grant amnesty both to Zelaya for any alleged crimes and to those involved in the coup." So do the people who write these articles about Honduras under the guise of the Associated Press have to know anything at all about Honduras? Do they need to read the San José Accord to actually have some knowledge of what it says? Apparently not, and neither does the NY Times take any responsibility for the accuracy of its information. If Zelaya was only going to be returned to power until the November elections, that presumes that Honduras will have NO president until January 27 when the newly elected president takes office. Also, the San José Accord only grants Zelaya political amnesty, not criminal amnesty. At least they got the purpose of the OAS trip right. It isn't to listen to the parties involved, it is to pressure the government to reinstate Zelaya as president. The delegation of the Organization of American States (OAS or OEA in Spanish) arrived in Honduras this morning, to meet with different public and private entities with the goal of promoting the signing of the San Jose Accord. Their caravan passed miles of pro-government taxistas (taxi drivers) lining the sides of the road carrying signs saying "Thanks for listening." In contrast, a group of zelayista taxistas blocked traffic on roads earlier in the day. Members of the commission include Foreign Ministers of Argentina, Canada, Costa Rica, Jamaica, Mexico, Panama and the Dominican Republic, as well as OAS Secretary General José Miguel Insulza. 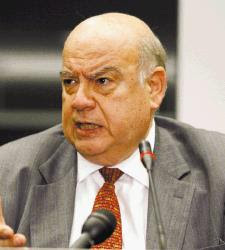 Honduras' government initially stated that it would not accept a delegation led by Jose Miguel Insulza, because of his "lack of objectivity, impartiality and professionalism in carrying out his functions, which has resulted in serious damage to democracy,'' but later agreed to his visit only in the role of "observer". 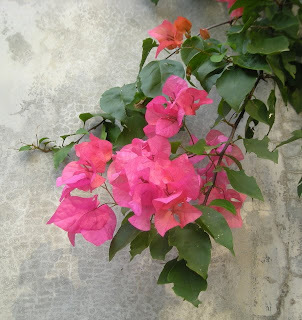 Note that a representative from Panamá has been added to the original list. Well, that is something, but not much when you consider the tense diplomatic situation with Argentina in which they kicked out Honduras' Ambassador and then arrogantly refused to remove their own Ambassador from Honduras. Not to mention a possible conflict of interests in that President Cristine Kirchner signed $1.1 billion in agreements with Venezuela's Hugo Chávez just two weeks ago. Jamaica and Dominican Republic are dependent upon Hugo Chávez's Petrocaribe for their oil supply. 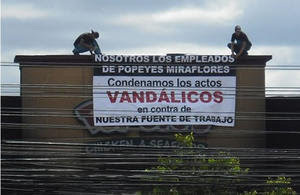 Costa Rica is obviously going to make the same demand as their president that Zelaya be returned to office. The Dominican Republic's Foreign Relations minister Carlos Morales demonstrated that he is not impartial when he stated, “It’s necessary to respect the OAS resolution, it’s the only thing. We’re going to make them respect us....” Morales said, adding that the Dominican Government supports Zelaya’s return to power. The Delegation’s agenda will not be limited to the public sphere. It will include meetings with representatives of the Catholic Church, Evangelical Churches, business people, workers, presidential candidates and different civil society organizations. That sounds good, but I understand the commission's closing press conference will be given tomorrow at 12:30 p.m.! Barely 24 hours after their arrival, they will already have their decision written, edited, and agreed to by the foreign ministers. That reminds me of the OAS meeting in July, after Insulza made a similar 24-hour trip here, talked to numerous people including ex-presidents and judges who said it was not a coup, but he declared it to be a coup anyway. My guess is that the press release is already written. "Secretary General Insulza stated: "We are motivated by a spirit of dialogue and the disposition to listen to all relevant actors in a situation that has gone on for too long. We are convinced that all players are inspired by a true desire for institutional restoration that would allow the elections of November 29 to produce authorities that are effectively democratic, legitimate and recognized by the international community." "We hope to find a positive reception to the San Jose Accord, as the only road to reach, at the same time, the return to full democracy and reconciliation among Honduran people. It is a satisfactory document that would allow a return to the state of affairs before the morning of June 28, reinstate the constitutional President and appease the main fears and meet the legitimate demands that gave rise to the crisis. This will allow Honduras to come out of this difficult test strengthened and offer an example of democratic conviction to the entire hemisphere." On June 28, he erroneously said the coup had been carried out by a "group within the military", called them rebels, and called for the Honduran people among others to "join forces". In another insulzing statement, Insulta stated, "It will not be Honduras that we will be suspending, but the usurpers of a democratic government, who have embarrassed the public service that they swore to take on with honor." And we are supposed to believe that this guy is impartial? Insulza's previous stand and refusal to talk to "the actors", along with false and biased media coverage, are in great part responsible for the internal rifts and violence in Honduras today. 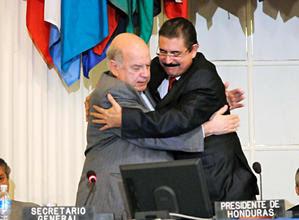 For all the talk of 'dialogue', 'negotiation', and 'mediation', both Insulza and Oscar Arias have made it clear from the beginning by using terms like golpistas, de facto government, illegal acts, and golpe de estado, that the San Jose Accord was in no way negotiable, that Honduras had been judged, convicted, and sentenced long before they were ever allowed to present the facts in Costa Rica. 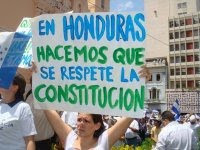 I am betting that this simple Honduras communique is the nail in the Insulza reelection coffin. A few countries must shiver at the idea that one day he might be the mediator of any conflict they might be involved in. Lists are probably drawn for his successor as I type. Daniel also touches upon the inflammatory and biased prose of the main stream media in this article. 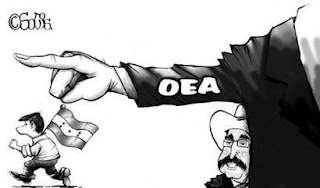 The 10 questions for the OAS asked by UCD, Honduras' united group of civic groups, and, among many others, this articled entitled What's wrong with Insulza and the OAS? 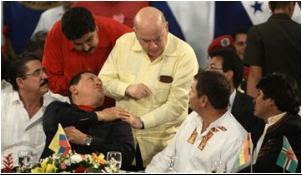 published by the Center for Security Policy make it very clear that José Miguel Insulza's motives need to be questioned. These 10 questions were prepared by the UCD for the OAS (Organization of American States). Unión Cívica Democrática is a large group of Honduran civic groups working to ensure the truth about what happened in Honduras gets published. I do not believe that you can read these questions without seeing the glaring hypocrisy of the OAS. but VOUCHING for the electoral fraud in Nicaragua and for the indefinite reelection of Hugo Chávez? while INTERFERING in the constitutional and democratic processes of Honduras? but IGNORING fierce repression of the Venezuelan opposition’s protesters? but IGNORING the Honduran Constitution, which was repeatedly violated by Zelaya? but KEEPING QUIET in light of the arbitrary closing of dozens of radio stations in Venezuela? And KEEPING QUIET in light of the government in Ecuador threatening to do the same? while ALLOWING governments that are allegedly democratic to support the drug trade, which is so harmful for true democracies? but FAILING TO CONDEMN the fact that rocket launchers sold to Venezuela landed in the hands of the FARC guerrillas? but PRESSURING for the acceptance of imposed, rather than negotiated, terms? but IGNORING repeated calls by Zelaya for mobs to rise up and engage in the kind of violence that has already resulted in the loss of life? but REFUSING TO HEAR OUT the overwhelming number of members of Honduran society who categorically reject a corrupt and failed leader, who repeatedly demonstrated that he values his personal interests above those of his people? On behalf of Honduran civil society, UNION CIVICA DEMOCRATICA requests that the honorable foreign ministers who visit us tomorrow give the Honduran people a public answer for each of these questions. May these answers enable the citizens of the entire American continent to understand the motivations of the organization that represents them. Tegucigalpa, Honduras, Centroamérica, August 23, 2009. You can read UCD's orginal statement in Spanish at the UnoAmerica website. 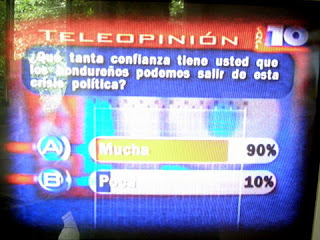 Channel 10 news, one of the most respected and popular channels in Honduras, has a text message poll each night. Usually there are 3,000-5,000 votes on a normal night. More than 80% of the population have cell phones − yes, even much of the poor. The polls encourage votes by including a contest with a prize of L.15,000 (US $794) and other freebies for a lucky random caller. Do you believe that we Hondurans are capable of getting Honduras out of this crisis through reconciliation and dialogue? 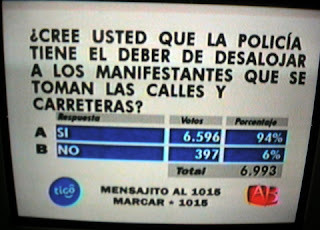 Only 1,500 voted 'no' − 4%. This was a record breaking response in the history of their polls. They continued the same poll again the next day. I didn't see the final results, but with about 20 minutes to go, the vote was approximately 63,000 yes (95%) and 3,000 (5%) no. Spirits and confidence are high. How confident are you that we Hondurans can get out of this political crisis? Do you believe that the intervention of the USA will help resolve the political crisis in Honduras? Unfortunately, by July 23, after threats by Hugo Chávez against Honduras were ignored by the USA, OAS, and UN, faith in the USA fell: Do you believe, with the threat by Chávez, that the USA has abandoned Honduras? Why would they say that? Because crime is so high in Honduras. The curfew reduced crime and made people feel safer. 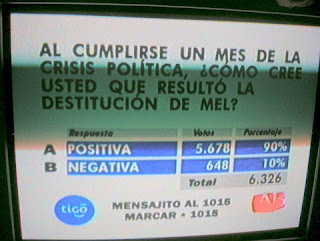 On the one month anniversary of the ousting of Mel Zelaya, July 28, the following question was asked: After a month of the political crisis, how do you think the result of the destitution of Mel is? More recently, on August 11, viewers were asked: How confident are you that Hondurans can get out of this political crisis? On July 31, after severe road blockages by the zelayistas, the question was: Do you believe that the police have the duty to remove the protesters that are blocking the roads and highways? On July 29, when there was talk of increasing sanctions against Honduras, Do you believe that pressure from the USA against Honduras is fair? I have not witnessed such a feeling of self-empowerment among Hondurans in the 8 years that I've been here. In fact, I've witnessed just the opposite: a beat-down, 'what's the use', 'nothing makes a difference', 'we can't change it' attitude. The economic reality may change, but right now, people are ready to stand up to the whole world, including the US, and say "Leave us alone! We know what is best for our country!" I doubt that many people − outside of Honduras! − could have predicted that Honduras would hold out for this long. Here we are eight weeks later. Some may call that defiance or arrogance or stupidity. I call that self-empowerment and self-determination and I think that it is a very good thing for the collective Honduran psyche. A few weeks ago, Hugo Chávez pledged to "overthrow" Roberto Micheletti. Micheletti responded to Chávez's threat on Honduran radio, saying, "Nobody scares us." Hondurans are proud people. They like hearing things like this. Respect and dignity are very important to Hondurans and they feel that the world is showing them neither. Continued insults only serve to solidify the resistance to world pressure. Midnight tomorrow, August 23 is the deadline for Honduran citizens to apply for your tarjeta de identidad so that you can vote in November. Please, please, please make sure that if you don't have a valid ID card, apply at the RNP office nearest you in Honduras or in the US (Houston, New York, Washington, Los Ángeles, Miami y New Orléans), find out where the TSE (Tribunal Superior Electoral) is registering voters. Apparently some shady business is going on in some of the Honduran consulates. Be sure to keep your receipt so you can show that you applied in time. Serious efforts are being made to sabotage the elections. Don't let that happen. Don't let apathy or lack of enthusiasm about the candidates keep you from voting. It has never been more important for you to study the candidates and vote your conscience. A low voter turnout will cast a shadow on the elections. It is estimated that about 18% of qualified Honduran voters are outside the country. If you are a Honduran US resident, your vote is needed. And, if anyone gives you a hard time or prevents you from registering at the US consulates, complain long and loudly! Contact the TSE and your local media. I don't know what procedures are going to be in effect in the Consulate offices, but if there is any way that you can get involved to make sure that the vote count is accurate and transparent, do it. The TSE has promised the most open and transparent elections ever. I just saw a story on the news − a real feel good story. A kindergarten teacher in Choloma has been teaching her class all along, despite what the unions say. 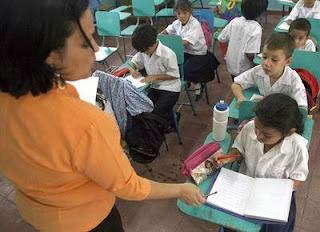 Someone burned her school and there is no money to fix it, so she gathered up all the little desks and chairs, filled up her living room with them, and continues to teach her class in her house. "I don't care. I don't care what they do or say. I love the children. They need to learn so I'm going to teach them." She isn't the only one. Other teachers disgusted with their unions and locked out of their schools by the directors are holding classes around their kitchen tables. So is my brother-in-law. Many schools are and have been operating normally. Parents are very proud of those teachers for doing the right thing for the children despite threats from the unions. Some schools are even guarded by parents, operating in shifts, to ensure that these teachers and their children are not menaced by the unions. The commission determined that the majority of the zelayista protests were peaceful, except for the burned bus, the burning of the fast food restaurant, and the attack on Congressman. That should tip you off right there that they don't have any idea of what has really been going on in Honduras. Everything the protesters did is the fault of the state and even children's rights can be trampled if you are upset about losing your president. The commission stated that four deaths were likely to be the fault of the state, thousands of people were arbitrarily detained, and that excessive force was used injuring dozens. There was more, but the sound was so bad that I couldn't catch it all. I guess we can be grateful that they didn't seem to buy the stories of death squads, concentration camps, cells of death, massacres, and rivers of blood that the zelayistas have falsely claimed. I feel like robbing a bank. I wouldn't be my fault. The following comment was received on my US Ambassador Hugo Llorens knew everything article, from a person who aptly calls him/herself "Person who knows a lot of S...."
1) Mel Zelaya asked for the meetings between his team and other leaders of the Liberal Party. 2) Mel Zelaya asked Hugo Llorens to serve as an Impartial Observer. 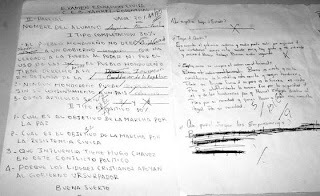 3) From Mel Zelaya's side the first Meeting was attended by Patty Rodas, but due to that she does not let anybody talk, Zelaya took Enrique Flores and Enrique Reina to the next Meetings. 4) From the other side, the participants were Roberto Micheletti, President of Congress, Elvin Santos, Candidate for the Liberal Party, and Carlos Flores ex-President of Honduras. 5) Four meetings took place. 6) Zelaya's side advocated that what they were doing was Historic, that changing the old Constitution that was controlled by "Los Grupos de Poder," would change Honduras forever. That through la "cuarta urna" the people would finally be able to have the power and the voice that they never had, and that now more than ever the poor, marginalized people of Honduras, were demanding for a New Constitution. 7) The other side stated that the Constitution was not the problem. That the problem was the politicians that did not uphold the constitution; that Honduras would be a different country if it became a country governed by laws and not by men. That the current constitution with its imperfections just like any other, was to be respected and obeyed, that one of Honduras's problems was that those who ruled Honduras would change the constitution with a new one in order to be more time in power. They stated that what Mel Zelaya was doing was unconstitutional and illegal. 8) During the 3rd meeting an agreement was reached where the question which was to be asked on June 28th would not be one where a National Constituent Assembly will be convened. Rather one where a commission would be formed in order to better and perfect the current constitution. Note: Hugo Llorens has THIS DOCUMENT. All sides agreed that he would be the one to keep possession of the document. All participants signed the document. 9) Mel Zelaya asked for a 4th meeting, where he stated that the question had to be of convening a Constituent National Assembly in order to write a New Constitution. It seems like Mel Zelaya had a talk with Chavez. 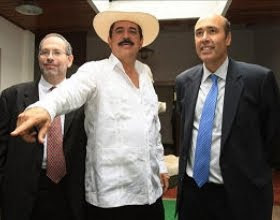 10) On Thursday June 25th, after Zelaya led a Mob to steal confiscated Ballots, Hugo Llorens called Micheletti, to tell him that Thomas Shannon, from the State Department had told him that the Obama Administration, would only recognize Mel Zelaya, that there was absolutely NO WAY that the USA government would recognize another government except Mel's. Before anything happened President Obama had already made up his mind. 11) On the afternoon of June 27th, the Supreme Court of Honduras voted 15-0 to remove Mel Zelaya from office, and ordered the Honduran Armed Forces to execute an arrest warrant. 12)Gustavo Bustillo, one of the 15 Magistrates to the Supreme Court, informed people close to President Zelaya of the Court's Decision. 13) Mel Zelaya knew that the next day, the Honduran Armed Forces were going to execute the arrest warrant and arrest him. 14) Zelaya then proceeded to talk with Papi Chavez; Chavez gave him certain orders for him to follow during the next hours, knowing that his arrest and detention were unstoppable. What could those instructions or orders have been? 15) Zelaya asked the members of the "Guardia Honduran Presidential" to go home that night, for them to arrive in the early morning. Only 2 "Cobras" from the Presidential Guard, were guarding Mel's house that early morning. 16) Zelaya was given enough time to get dress that morning, but he refused. 16 part II) Zelaya asked to be taken to Costa Rica. 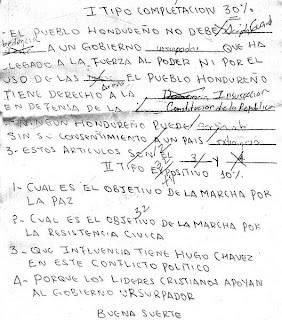 17) Zelaya provided the Honduran Armed Forces with his resignation letter dated June 25th for unknown reasons. 18) Hugo Llorens had been drinking with friends the night before. He woke up that day until 9:30 am; the State Department had been calling him for Hours. 19) Llorens immediately yelled "Coup, Coup, Coup." It certainly sounds like 'Person who....' does know a lot of....stuff. This described what I've read and heard on the interview with some added details. It also includes several things that make more sense to me than what has been reported, especially as to what was reported by Mel Zelaya on Sunday, June 28. The only discrepancy that I noticed was that I thought that I heard Micheletti say that there were three people from the Liberal party in addition to himself. Maybe I misheard the interview or maybe there were different persons in the four meetings. The US is on the wrong side of this issue. By taking the stand that they have, they are acting against the constitutional government of Honduras. I call this interference in the sovereignty of another nation. The US has been wrong before and unless they change their position, history will show that they were wrong here. While US President is passing out apologies, how about sending one Honduras' way? Hey, Person, feel free to send me more s..., errr, stuff anytime. Thanks. Pretty low when you are a zelayista teacher who has the power over children's minds. For example, this kid wrote that "The Honduran people have the right to: democracy." WRONG! "The Honduran people have the right to: insurrection" is the correct answer. What does coup d'etat mean? What was the date of the coup d'etat? What role did businessmen have in this political conflict? Explain how the constitutional order was broken. What influence does Hugo Chavez have in this political conflict? Why do the Christian leaders support the usurper government? For the question, What is curfew?, one student answered that "It is when the government orders that no one can go out for the security of the citizens..... WRONG! The correct answer is "Curfew is when the usurper government restricts our right to free circulation." The Federation of Parents were finally allowed to present a report of complaints to the CIDH commission (OAS human rights group). Many parents and teachers are demanding the removal of the school directors who have prevented children from attending school and the Minister of Education has announced that teachers who have not worked during this period will not be paid. In one school, zelayistas attacked other teachers who were teaching against orders of the union. Several students were injured. Meanwhile, the Federation of Teacher Organizations of Honduras (FOMH) informed that the teachers returned to classes Monday, Tuesday, and Wednesday, and the other days of the week, they will return to incorporate in the manifestations in the streets. Union leader Jaime Rodríguez affirmed that the teachers and professors in the schools also move forward a campaign to explain to students and parents of the families the necessity to recuperate the constitutional order. 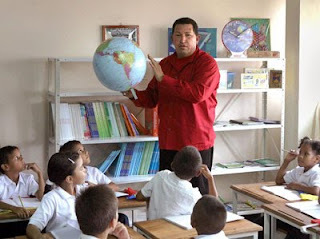 For a scary view of Chavez's new education reform in Venezuela, see this Economist article: Hugo Chávez seeks to catch them young. I don't care for the repeated references to "the elite" because that just is not true. 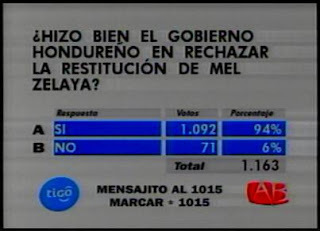 The majority of the population from all economic groups are glad that Mel Zelaya was stopped. Central Americans are, in general, much more knowledgeable about the real threat of socialism/communism (the terms are often used interchangeably here) than the average north American because they have faced those threats in recent history. And for any Latin American leader who feels confident of their hold on power, Honduras offers a sobering lesson in how quickly a president can lose control. Luis Vicente Leon, an analyst with Venezuela's Datanalisis polling firm, said all of Latin America's leftist leaders "have a lot of enemies." "No one," he said, "is immune." "Simply, Honduras says no to socialism disguised as democracy." "It has been said that Democracy is the worst form of government except all those other forms that have been tried from time to time." "The threats against democracy in Latin America, and I don't in any way minimize what's happened in Honduras . . . are not those coming from military coups, but rather from governments which are ignoring checks and balances, overriding other elements of government," said Jeffrey Davidow, a retired U.S. ambassador who served as President Obama's special adviser for the recent Summit of the Americas. Let there be no ambiguity here. Little Honduras was supposed to be the next country to lose its liberties as it joined the anti-American, pro-Iranian Latin American left. But Little Honduras decided to fight back. And this has infuriated Venezuela's Hugo Chavez, who will surely attempt to foment violence in Honduras. Therefore, if you love liberty, you will do whatever you can do help Honduras resist Chavez and his allies, which include the United Nations and Organization of American States. There are many ways to do that. Buy Honduran goods. Write your representatives in Washington to back the present, law-based Honduran government. And, yes, even visit this friendly beleaguered place. When the world's governments isolate a country, with few exceptions, that's all you need to know about who the good guys are. "We are subject to media and political terrorism," said Ayala. Yes, I believe that it is true in most countries − not Venezuela, of course, but most countries − that when a politician is caught in several big, fat lies, the media goes nuts over it, don't they? Not to mention the possible FARC ties of the UD political party. Ask yourself this: what would happen if your senator made a human rights accusation against the government of Barack Obama saying that he or she was forcefully denied entry to the congress, was assaulted, and was not paid his salary....and later it was found to be totally false? Did you think that the media would be interested? Hah! Talk about media persecution! I imagine that he would do the honorable thing and resign. Not Silvia, though. I see that outrageous claims are being made to the CIDH human rights commission, but I just don't understand how these fools thought they could get away with something as easily proven false as whether they received a paycheck or not. Personally, as poor as Honduras is, as much need as there is in this country, I don't think any government employee who doesn't go to work should get paid. Ayala accused the media of "inciting hate against the principal actors." Whoa there! You can't have it both ways. Either media outlets that promote hate − of which we have at least two in Honduras, both generously funded by Mel Zelaya's government − should be controlled, or we should have freedom of the media. Click to enlarge the graphic. 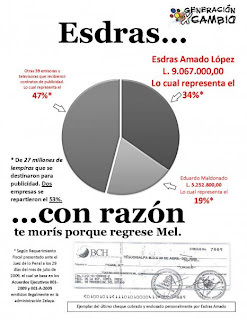 Of the recorded presidential publicity payments (it is believed that there were many more payments related to the cuarta urna), one person, Esdra Amado López of Channel 36 received 34%, Eduardo Maldonado of Radio Globo received 19%, and the other 39 radio and television stations received 47%. Needless to say, these two two well-paid people spew hate and promote insurrection. Ayala's charge is baseless anyway. Read the article for yourself in Spanish or a Google translation to English. There is no hate in the article. Please keep this one small example in mind when you read about human rights violations in Honduras. Double standard. Double standard. Double standard. Double standard. Double standard. Double standard. Double standard. Double standard. Double standard. Double standard. Double standard. Double standard. against our source of employment"
According to the news yesterday, the OAS human rights commission (CIDH) report on Honduras is basically already decided. Apparently they are refusing to talk to anyone except those in the so-called Resistencia. You remember who they are, right? The ones who are blocking roads, attacking police, denying children education, and burning buses, cars, and businesses. The reporter is showing the same confusion and disappointment that so many of us here in Honduras have felt since the beginning of this whole mess. Minds are made up, don't confuse them with the facts! Law abiding citizens rights, including children's rights, don't matter a damn. It's only the criminals who need to be protected. Millions of poor Honduran children have been denied their constitutional right to an education. Thousands of teachers who want to teach have been intimidated, threatened with losing their jobs and even violence by corrupt union leaders and school directors. Not important. While the commission refuses to talk to 123 congressmen*, they will talk to the 12 congressmen who have refused to attend congressional sessions, but still come to collect their generous paychecks, while the poor in this country continue to go hungry. Not important. Similarly, teachers and other government employees collect their government paychecks without working. They do this while blocking roads preventing others from getting to their jobs, delivering their products, or exercising their constitutional right to freely circulate. They get to talk to the human rights people. Those denied health care and other government services do not. Many citizens have been threatened or physically attacked, many businesses have been damaged or destroyed, all by the so-called Resistencia. No, they don't get to talk to the OAS CIDH commission. Not important. A large group of fast food employees tried to talk to the commission. They arrived at 9 a.m. and were told that only written complaints were accepted. They wrote complaints about being fearful to go to work, about being subjected to falling sheets of glass (from rioters breaking windows), bombs, and fires and about suffering from threats and psychological damage because of the violence in their workplaces. They waited all day until 5 p.m. Nope. They aren't important. A large parent group went to talk about their children being threatened and brainwashed by Zelayista teachers. No. Not important. Apparently, unless all of these people start throwing rocks and starting fires and then resist arrest, they aren't going to be heard. * One bright point occurred yesterday which gives hope. (Google translation) Twelve of the congressmen "in resistance" reported to the CIDH commission that they have been prevented from attending the congressional sessions and that the new oppressive government is not paying their salaries as further pressure. The commission went to the Congressional building and met with a committee of 12 congressmen from four political parties to find out if these salaries had been paid and whether these congressmen had been denied access to the National Congress. The representatives of the fifth political party, UD, were among those who have not attended sessions since June 28. The CIDH commission members were provided with payroll records showing that the congressmen and women in question had punctually come to collect their full salaries in July and August. They also provided attendance records showing that these congressmen, who had been paid, had not attended a single session of congress. As to being denied entry to the sessions, the congressional committee pointed out that the doors to the congressional floor are open to the point that the media transmits "live and in color". If there had been any sort of altercation or assault, as those 12 congressmen falsely claimed, it would have surely been covered by the media. The committee also asked about the new "Obligatory Military Service" law which has been denounced. This took the congressmen by surprise because no such law is being discussed. Military service in Honduras has been voluntary for 15 years and the current law being discussed is Ley del Servicio Militar Voluntario y Educativo (Law of Voluntary and Educational Military Service). José Saavedra, President of the Congress, said that the commission was convinced that an obligatory military service law had been passed and that is "simply not true". They provided copies of the proposed law, the report, and the first two debates that have been held to prove resoundingly that this charge also was false. One Congressman was still not hopeful about the fairness of the CIDH report, saying that it is already written based on the false complaints of people associated with ex-President Zelaya. He noted that the committee did not even talk to Congressman Ramón Velásquez (who was also in the meeting) about being assaulted by zelayistas outside the congressional building last week (video here). Chavez's ALBA financing the violence in Honduras? Chavez's ALBA (Bolivarian Alliance for the Peoples of Our America) consists of member countries Venezuela, Cuba, Ecuador, Bolivia, Nicaragua, Dominica, Saint Vincent and the Grenadines, Antigua and Barbuda, and, for now, Honduras. In this declaration of August 9, ALBA countries admit to funding the Honduran Embassies and "priority activities of the legitimate government of Honduras". Besides jet-setting around the hemisphere in Chavez's airplane, the only Zelaya-government activities that we are aware of are insurrections, vandalism, and violence against the people, businesses, and the institutions of Honduras. Did ALBA send the US $3 million that was changed in the black market by a Nicaraguan? 2. We energetically condemn repeated violations of the human rights of the heroic Honduran people by the golpista military regime, and we reiterate our support for their right to resistance and insurrection, consecrated in the Honduran National Constitution, against the oppression of an illegitimate regime. We reiterate that we will accompany the resistance process to its final victory. 3. We reiterate our commitment to maintain all cooperation programs underway with Honduras, a full member of ALBA, to be carried out through President Zelaya, and as well to include funding of some priority activities of the legitimate government of Honduras, and the funding of activities of the respective Embassy of Honduras in each of our countries. 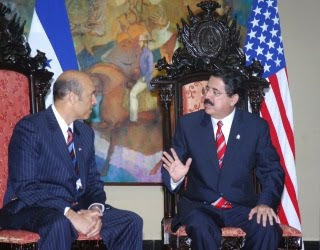 In a television interview of Honduran President Roberto Micheletti on Frente a Frente today, President Micheletti reported about four lengthy meetings held at US Ambassador Hugo Llorens' residence in the days before June 28, 2009. The following is from the television interview. The comments in brackets  are mine. 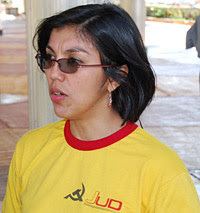 Micheletti was in the first three meetings along with former President Zelaya, Minister Patricia Rodas, Minister Enrique Flores Lanza, Hugo Llorens, Llorens' assistant Simons, and three other Liberal Party members. In the first meeting, Patricia Rodas spoke for one hour and 25 minutes and in her dissertation she reminded Llorens that "all the coups have occurred in this house [referring to the US Embassy]." Micheletti said that Llorens said nothing because he was the mediator. 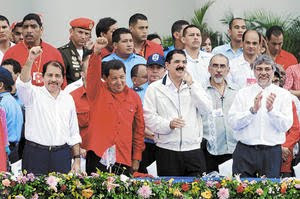 Zelaya and his Ministers were trying to convince Llorens to agree to the "survey" while the others, along with a "ton" of other people, were trying to get Zelaya to not perform this illegal act which would be effectively be a golpe de estado [coup d'etat]. Micheletti did not attend the fourth meeting but the others were able to obtain a document in which Zelaya agreed not to mention a constitutional assembly but to call it something else. However, in the next meeting, Zelaya backtracked and said it had to be a constitutional assembly. 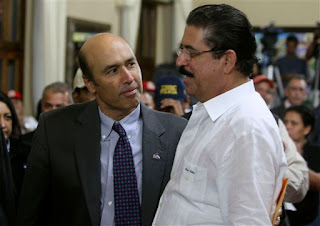 On Thursday, June 25, Llorens called Micheletti to tell him to think about what they would do because the US would not recognize the destitution of Zelaya. On Saturday, June 27, Micheletti called Llorens to tell him to talk to Mel to get him to stop. He said "You [Llorens] have heard all the discussions and negotiations. Talk to him [Zelaya] so that he doesn't insist on the constitutional assembly which is illegal, unconstitutional, and will cause problems in the future." Llorens promised that he would. Micheletti doesn't know if Llorens ever talked to Zelaya or not. Arturo Corrales also went to the Casa Presidential on Saturday afternoon and stayed until 3:00 a.m., trying to talk Zelaya out of going forward with his plans − to no avail. After Zelaya was removed on Sunday morning, Ambassador Llorens called Micheletti to tell him that they should have let Zelaya have the "poll", that nothing would have happened. He condemned the decision of the Honduran authorities and threatened to promote sanctions against the current government. 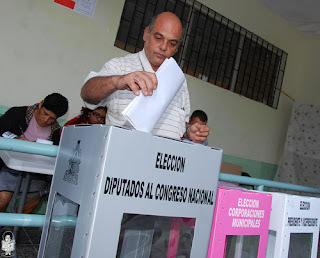 [This despite the fact that early in the month, Llorens declared, regarding Zelaya's planned referendum, that "One can’t violate the constitution to create another constitution, because this would be like living under the law of the jungle." From Babalú: "No one seems to be paying much attention to it but another coup has occurred in the Americas. This coup, at least by the new definition given to the term that now includes the legal and constitutional removal of rouge and corrupt leaders, happened yesterday without much media coverage." CNN reports: Britain says it has suspended the government of the Turks and Caicos Islands and imposed direct rule after allegations of systemic corruption and "serious dishonesty". Reuters London reports: Britain ordered the suspension of the government of its Caribbean territory of Turks and Caicos on Friday and imposed direct rule after an investigation found evidence of widespread corruption. Neither 'allegations' or an 'investigation' represent a lawful trial. But don't worry. Britain did not take "lightly" it's decision to throw out the entire constitutional government of TCI. It's only until TCI's "affairs are put back in good order". I presume that Britain, in its infinite wisdom, will decide what is and what is not good order and without the interference of the UN, OAS or US, Castro or Chávez, or the citizens of Turks and Caicos. British-appointed governor Gordon Wetherell made the announcement two days after former Premier Michael E. Misick lost a legal challenge to stop Britain from imposing direct rule. Misick was denied any further appeals. Governor Wetherell will assume all powers, duties, and functions of the Premier, the Cabinet, and the elected House of Assembly. He alone will enact laws and he alone will appoint and remove members of the advisory committees, whose advice he is not obligated to follow. Sounds like a dictator to me. "This is not a 'British takeover,'" said Governor Wetherell. British authorities said the step was needed to restore good governance and sound management in the territory. Both the ministerial cabinet and the elected House of Assembly will be suspended for a period of up to two years. The constitutional right to trial by jury is also suspended. Islanders will be allowed to vote for new leaders no later than the regularly scheduled elections in 2011. 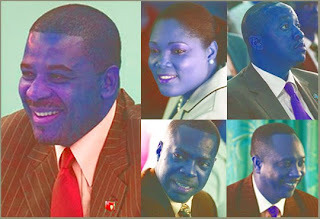 Public services will continue to be run by people of the Turks and Caicos islands, as indeed they should be," he said. "I believe most people in the Turks and Caicos will join me in welcoming these changes." Do I have this straight? The former Premier who resigned in March was alleged to be corrupt so the current Premier is overthrown by Britain in August? The deposed premier removed by the British takeover, Galmo Williams, condemned the suspension of the constitution and government as a coup that he said put Britain "on the wrong side of history." Misick's successor Williams called it a "coup d'etat". "Our country is being invaded and re-colonised by the United Kingdom, dismantling a duly elected government and legislature and replacing it with a one-man dictatorship, akin to that of the old Red China, all in the name of good governance." A British naval ship is on patrol in the Caribbean to provide military support if TCI politicians don't fall into line. What? Military rule over the tiny Turks and Caicos Islands? Hopefully TCI politicians won't call for insurrection and import Nicaraguans and Venezuelans to start trouble as Honduras' Mel Zelaya has. Mark Nestmann says that the UK's Foreign Commonwealth Office issued recommendations and then warnings − sounds like what the Electoral Tribunal, the Attorney General, the Congress and the courts in Honduras did, except not quite so official as in Honduras. Justice Sir Robin Auld, who was in charge of the public corruption commission, admitted that much of the information received was hearsay or "possible" but that corruption is difficult to prove. As a result, he suggested reversing the burden of proof and requiring the accused to prove their innocence. It seems that TCI citizens are not even to be offered the protection of the English legal system. One of the conclusions of the report was that the TCI government is "at a near standstill" with its "financial position so bad that the Government cannot pay many of its bills as they fall due" − sounds like Honduras. There were "clear signs of political amorality and immaturity and of general administrative incompetence" − sounds like Honduras. Honduras also went through the courts, but Secretary General Insulza of the Organization of American States basically ordered the Supreme Court to reverse their decision. If the Premier of TCI had chosen to ignore the British order, do you think that the military would not have been used? Now why do you suppose that the UK does not want to leave these democratically elected, allegedly corrupt politicians in charge while they do their investigation and throughout the trial until if and when they are legally convicted? Should Britain be alienated by world, forced to reinstate Williams, be told to move up their elections, their court forced to reverse its decision, be called coupsters (golpistas in Spanish) by the UN? Get out those burning tires and send in CNN. Crime and corruption are no reason to oust elected officials in a civilized world! Corrupt officials must be reinstated, otherwise this is a threat to all corrupt officials everywhere! These people are being oppressed by a dictator installed by the British Empire. Can elections be considered legitimate when held under a dictatorship? Send in the Human Rights crews! This must be stopped! It seems to me that Honduras also had clear signs of corruption, "political amorality and immaturity" and of "general administrative incompetence", but instead of suspending the constitution, Honduras followed theirs and yet has been condemned by the world. This just reeks of hypocrisy and double standards. Does it have anything to do with fact that Britain is considered a civilized first world country and Honduras is not? Did the world jump to conclusions because of racism and snobbery? Sorry if that insults anyone, but that is the way it looks from this side of the border. Now if only the media had called the ouster of Mel Zelaya a "suspension"....Where would we be now? What is really happening in Honduras?